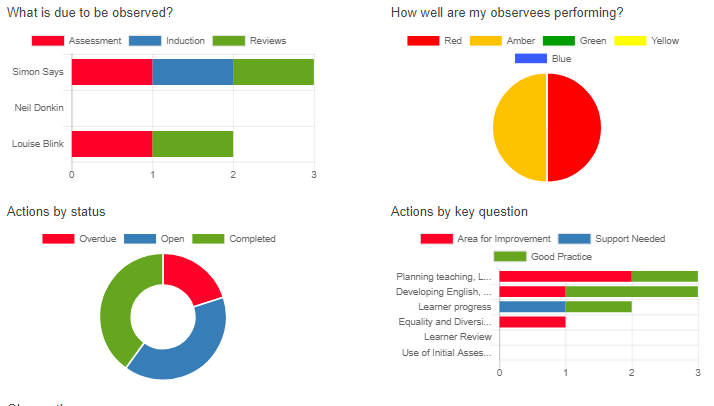 This article describes the Observe dashboards by user permission and the 4 charts. When you first log into Observe you are introduced to your own personal dashboard. 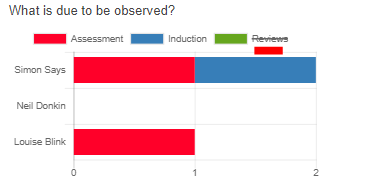 There are currently 4 different charts and can be refreshed to show the activity which is completed or due 1, 3, 6 and 12 months. You will see different sets of data dependent upon your permission settings. For example, when you select an interval of 12 months; all activity which has taken place in the past 12 months and all activity which is due in the next 12 months will show on the dashboard. As an observe super user you will have access to all observers and all activities taken place or scheduled. 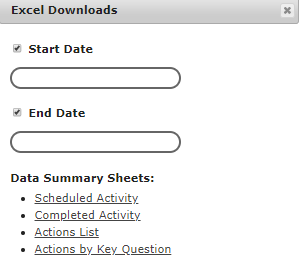 Simply click on the observer you want to see what is scheduled and completed. As an Observer you will have access to the dashboard which aggregates the data for all the observee activity you have completed or are responsible. If you are also observed you will also have your own observee dashboard - See below. As an Observee you will have access to the dashboard which aggregates the data for all of your own completed and scheduled activity. If you want to see any of the charts without a particular item of data, then simply click on the legend item you wish to hide. If you are an Observer you can access your observees dashboad by clicking on their name.